If you aren’t earning a lot of money or you’re barely making ends meet, paying off your debt may seem impossible. People fall into debt for a variety of reasons. Regardless of whether you have mounting credit card bills from past financial mistakes, student loans, medical bills, or something else, debt can feel all-consuming and completely overwhelming. Yet, did you know that it’s possible to pay off every last penny you owe? It’s not always easy, but with some determination and dedication, you can pay off your debt, save more money, and improve your entire financial situation. Here’s how to pay off debt when you have a small income. While you may be eager to jump right in and start tackling your debt, if you don’t have an emergency fund, this should be your first goal. Without an emergency fund or financial buffer, any unexpected costs can derail your debt repayment process. Maybe your car breaks down and needs repairs, or you had a larger heating bill than you budgeted for. Whatever the case, when emergencies come up, you need money – and fast. So, start an emergency fund now with a separate savings account. This way you aren’t tempted to use it for your day-to-day spending. If this feels overwhelming, start small. Even $500 saved up can help you out in a stressful financial situation. A “minimum needs” budget is a budget that covers just your most basic living expenses, such as rent, groceries, and debt-repayment. It should be pretty bare-bones and should eliminate all non-essential spending. To start your budget, you first need to determine the cost of your everyday living expenses. These are bills you can’t cut out – bills that need to be paid every single month, like rent, groceries, and utilities. As you create your budget, see if there is any way you can work to lower your bills. For instance, if you have an extra bedroom, can you find a roommate to save money on rent or your mortgage? Can you lower your grocery budget by clipping coupons and signing up for your grocery store’s rewards program? Perhaps you can consider cutting out cable to save hundreds, if not thousands, of dollars every year. Every little bit helps. The point of a minimum needs budget is to free up as much cash as you can. Every dollar you have to spare can be put towards paying down your debt. To help you get going, start budgeting on a spreadsheet or use a budget app. And remember: no matter how you choose to track your money, the most important thing is to set a budget and stick to it. If you have debt, it’s a good idea to find out if you can save money by refinancing your loans. Refinancing your debt essentially means another company buys out your debt. In return, you start making payments to your new debt servicer, and this new company then collects your interest payments. Refinancing companies typically offer you a lower interest rate to gain your business. This helps you because over time, you won’t have to pay nearly as much money in interest and can make a bigger dent in your principal loan balance. Take it from me: it’s worthwhile to do your research and refinance if possible. A few years back, my husband and I refinanced some of our student loans and now pay a two percent lower interest rate than we were originally paying. This is saving us thousands of dollars in the long-run. You can’t succeed on your own. Without solid goals and accountability, you’re much less likely to ever become debt-free. In fact, in a study done by psychology professor Gail Matthews of Dominican University, it was found that sharing your goals with a friend is the key to accomplishing your goals. In her study, Matthews found that people who both wrote down their goals and had an accountability partner had a 76 percent success rate of accomplishing their goals. In comparison, there was another group in the study which was instructed to only think about individual goals. Only 43 percent of those people accomplished their goals. So, practice writing down goals following the SMART method. With this method, your goals meet the following criteria – Specific, Measurable, Achievable, Relevant, and Timely. Once you’ve developed your SMART goals, share them with a friend or two. Ask a trusted friend or family member to check in with you and hold you accountable. Cutting back on your spending certainly helps you pay off debt faster. But unfortunately, there is only so much you can cut out. Once you start earning more money, put the entire amount of extra cash towards your debt. You’d be amazed at how much faster you can progress when you can put $100, $500, or even an extra $1,000 a month towards your debt. Even if you’re taking all the right steps, it can take years to pay off debt. In order to stay in the debt-repayment game for the long-haul, it’s imperative that you give yourself a little break once in a while. The idea here is to give yourself a small, guilt-free allowance each month. Because it’s already in your budget, this is money you can freely spend without feeling regretful. The concept of a financial allowance is a lot like dieting. People are more successful when they allow themselves a rest day and a cheat meal once a week. It keeps them from feeling deprived and prevents large, impulsive purchases later. So, factor a little free spending into your budget. Whether you give yourself $15 a month to go to the movies or $30 for a night out with friends, the choice is yours to enjoy…guilt-free of course. Paying off debt isn’t easy, especially on a small income. But with grit, hard work, and a whole lot of commitment, it is possible to live a life free from the burden of debt. Are you ready to follow these 6 steps and get started? For three years in a row, American adults have the same top financial regret. 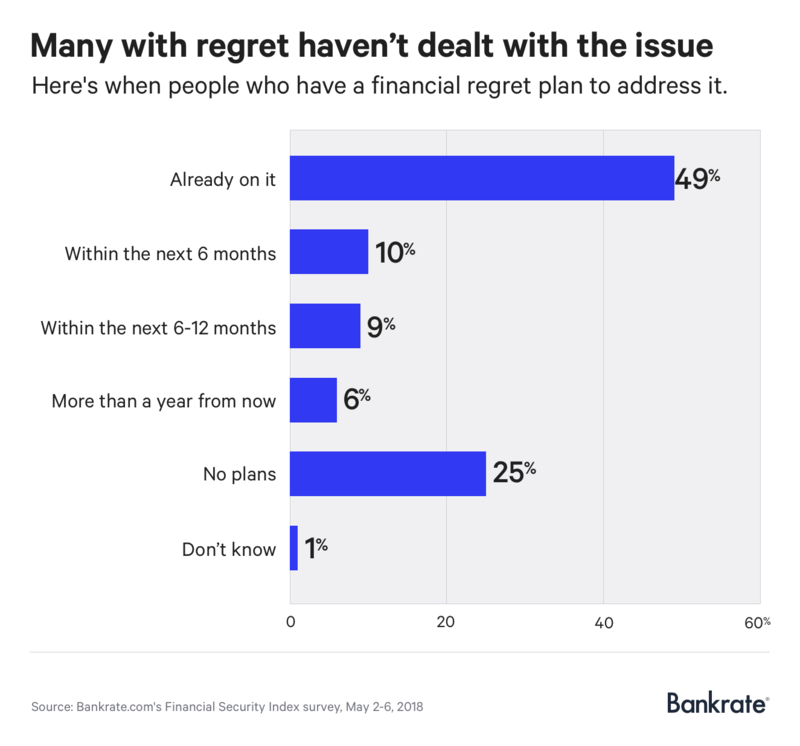 A May 2018 survey from Bankrate looks at the top financial regrets among Americans and how they deal with those financial regrets. By looking at the most common regrets, we know where we can best focus our future efforts on our investments, bank accounts, and beyond. 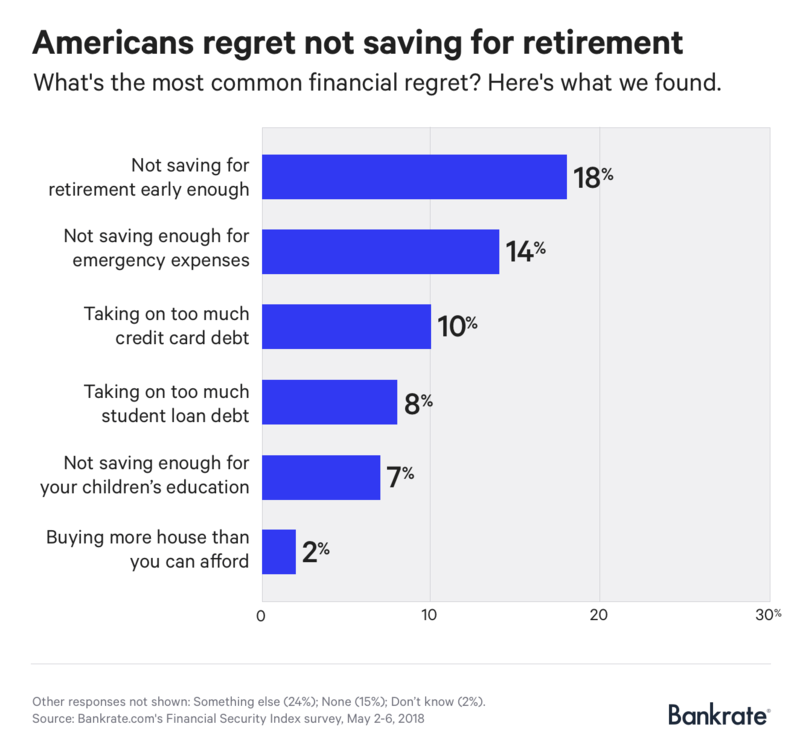 The number one financial regret among Americans is not saving for retirement early enough. This financial regret claims the top spot for the third year in a row in Bankrate’s annual Financial Security Index survey. This answer was number one for 18% of respondents. Number two on the list is not saving enough for emergency expenses, with 14% of respondents most regretful about this. For workers in any profession, an emergency fund is an important part of maintaining financial stability. For freelancers and entrepreneurs, it is best to save at least six to 12 months of expenses in emergency savings. The third most common regret is taking on too much credit card debt, with 10% of responses marking this as number one. This is no surprise, as Americans have over $1 trillion in credit card debt. The average household holds $8,600 in credit card debt. Number four on the list is taking on too much student loan debt, a top regret for 8% of respondents. Americans have nearly $1.5 trillion in student loan debt. 44.2 million Americans have student loans, according to Student Loan Hero data. The fifth most common financial regret is not saving enough for a child’s education, coming in with 7%. Both number four and five on this list share a commonality: they relate to a high cost of college. Number one and number five also have a big common trait: they both involve savings. These two topics are an important part of Americans’ biggest financial struggles. Last on the top financial regrets list is buying more house than you can afford, with two percent of respondents choosing this answer. Like college, housing costs generally go up, up, up over time. In some areas, buying even a modest home takes up a huge portion of take-home pay. The list of common financial regrets does not yield many surprises to those who follow economic news, but how people respond to their biggest regrets is a bit more interesting. A full 25% have no plans to deal with their biggest financial regret and continue to go on living with it. A nice relief, however, comes from the 49% who are already working on addressing their biggest financial regret. Whether it is debt, savings, or something else, a good budget and focus on finances can help overcome most money challenges. While better than the quarter of Americans with no plans to address financial regrets, 19% plan to start work on their money problems within a year while six percent plan to do so later on in the future. Only with a long-term focus on your finances can you rise above the statistics and go forward with no money regrets. While most of us would want to be wealthy someday, it takes a real effort to turn that dream into a reality. The best way to avoid many common financial regrets is simple: avoid going into debt. While it may not seem like a big deal swiping a credit card for a TV or choosing the expensive out-of-state school, credit card debt and student loan debt payments are a very real. The next major focus to avoid a big regret is to save. Start with even $1 per week. No amount is too small. You can always increase it later. But if you don’t start saving, you will never build up savings to pay for a home, education, or retirement. Thanks to the time value of money, the sooner you save, the better. Compound interest and compound investment values help your money grow over time. If your money has more time to grow, the impact of that growth is exponentially helpful. Recovering from financial regrets is very difficult. Rather than turn around a difficult situation, avoid it from the start. That is one of the best paths to lifestyle satisfaction and a life free of financial strain and worry. How you spend your money is a loaded subject. Nearly half of Americans deem finances a hard subject to address with others. They rate it more difficult to navigate than politics or religion. Sixty-eight percentwould rather disclose their weight than talk about finances. More than 40 percent don’t even broach the subject with the person they marry before entering into holy matrimony. Even to yourself, how y0u spend your money is a topic you most likely avoid thinking about.